At the hot new “protest art” exhibit at the Brooklyn Museum on Saturday, a cluster of museumgoers shattered the silence, breaking into a call and response. An installation on the wall soon morphed into a performance piece, as activist Alicia Boyd launched into a mic check, and distilled her community’s outrage into a fierce proclamation. “Every black community is under attack!” cried Boyd, as the exhibition space echoed with a litany of grievances about homelessness, displacement, and greed. As security staff swooped in, Boyd pointed to the installation behind her: a presentation on gentrification and displacement, arranged around a screen. “This is my exhibit, this is my exhibit!” Boyd countered. The staff backed off when they realized that the artist was indeed imitating her art. Her face then appeared on the screen in a video decrying gentrification, framed amid a montage of scenes of organizing campaigns. On the same floor, another protest erupted at This Place, a photography exhibit depicting the Israeli occupation in a supposedly “balanced” light. 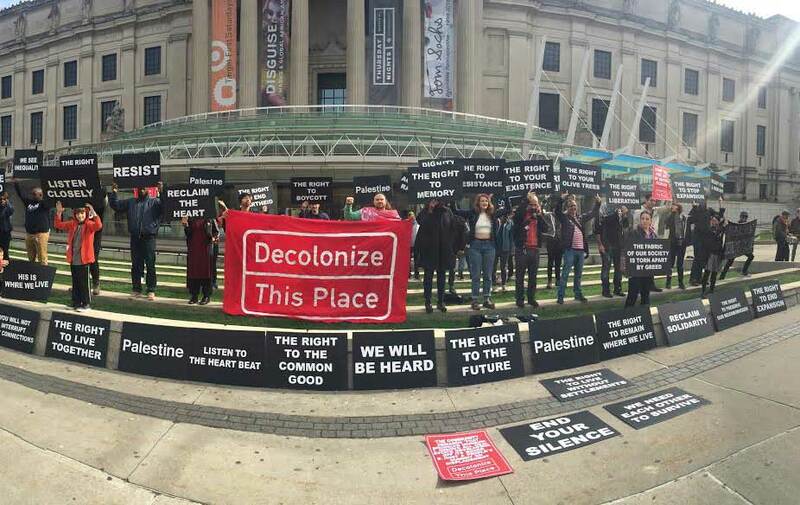 A group of protesters chanted, “Decolonize this place!”—denouncing the occupation of Palestine and linking it to the museum space itself, as another product of historic land colonization. To rectify the framing of certain pictures, they placed their own labels by the official Israeli titles, to reveal the Palestinian names. Eventually security escorted the protesters outside. Some climbed onto the balcony on the museum’s facade to drop banners displaying the slogans “Black Lives Matter” and “Decolonize This Place,” which were quickly whisked away. The museum saw these parallel exhibits as representing two exciting artistic vanguards. To the protesters, they were two glorifications of one contiguous colonization project stretching from the West Bank to Williamsburg. With the juxtaposition of a dubiously financed exhibit celebrating a colonial project and another seeking to expropriate the vernacular of popular protest, local artists see the gulf widening between private agendas and a public cultural institution. In a mission statement, the coordinators of the weekend’s actions, known as Decolonial Cultural Front (DCF), presented a two-front challenge, contending that both gentrification and occupation shared a common ground in Brooklyn, and the museum was a contested space for a symbolic reclamation. At the protest-art exhibit Agitprop, meanwhile, Movement to Protect the People, the community group Boyd helps lead, raised a similar critique of colonization and displacement via soft power. Bristling at flattened portrayals of movement graphics and logos, they urged the museum not to allow real-estate developers on its board, and to instead convene a “People’s Summit” to foster public dialogue about gentrification and inequality in local communities. “We’re saying, you can’t use the museum as a project of colonization at the same time as you want to house protest art,” Mirzoeff said. DCF has also reached out to activist and scholar Angela Davis, whom the museum plans to honor later this year, seeking to engage her on their decolonization campaigns in light of her activist work on issues of racial justice and Palestinian rights. Yet as they gathered outside, to the tune of a radical marching band, the “right” side for the agitators was clear as ever. Palestinian-American DCF activist Amin Husain told The Nation, “This is our museum. We paid for it. It’s an important part of our community. But the question that it raises is, ‘Who do they represent as the community? Who do they imagine their community to be?’ And so this action is about holding it accountable.” In the museum’s public space, the group aimed to resist a powerful institution’s abuse of a cultural commons, locally and globally. “They have broken promises to this community,” Husain said. Before the museum’s neoclassical facade, activists held black-and-white placards declaring “The Right to Live Free of Oppression,” “The Right to Memory,” and “Greed Kills”—slogans that simultaneously addressed the museum’s elite executives and resonated with embattled neighborhoods below. The activists might have been removed from the exhibits, but they remained, as always, where they were most at home—on the outside.